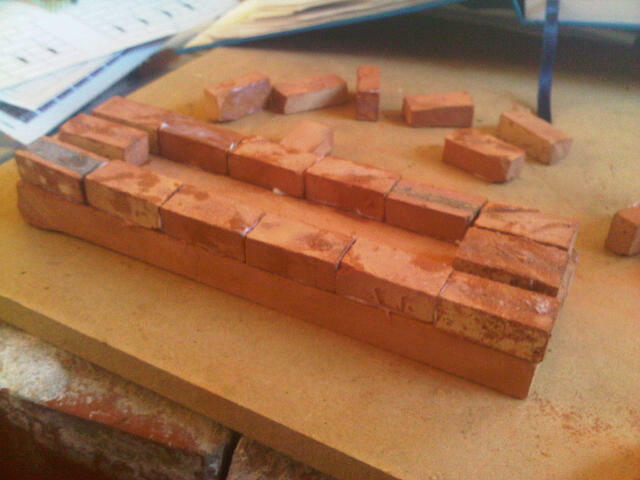 Mini and Maxi bricks are cut from Yorkshire clay in the Isle of Wight. 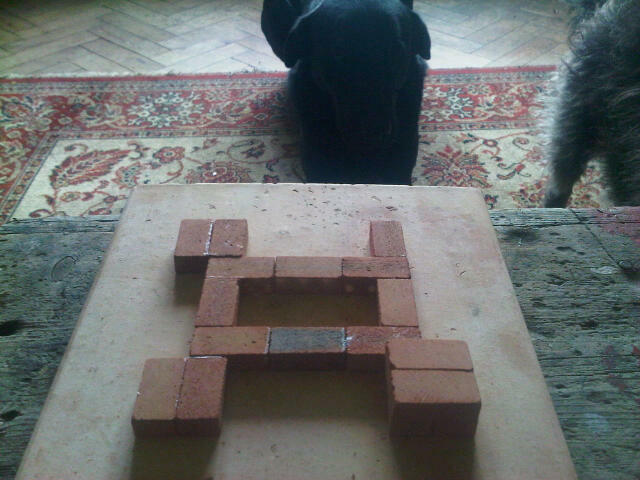 12p each Mini brick (Maxi bricks at 18p each). 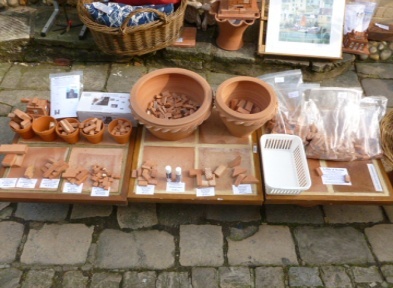 Supplied loose or in kits which include Small Georgian House, Castle, Albert Barracks, Castle Walls, Shed, Garage, Beach Hut , Fantasy Towers, Brading Roman Villa Ruins. 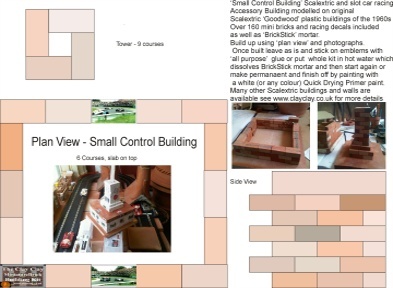 Scalextric type ‘Pits’, ‘Grandstand’ and ‘Control Building’. 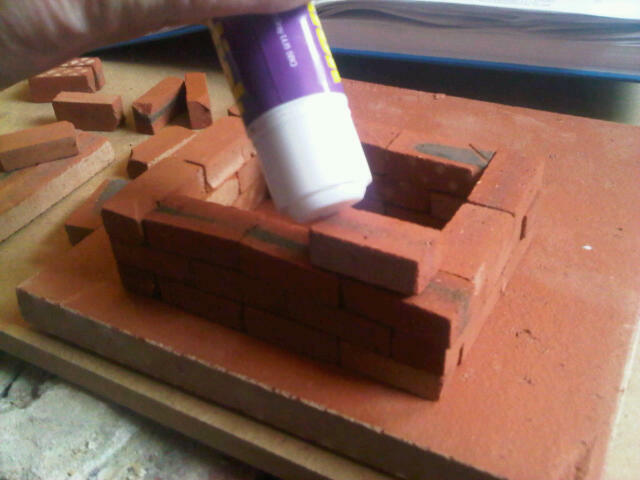 Use with ‘BrickStick’ mortar. 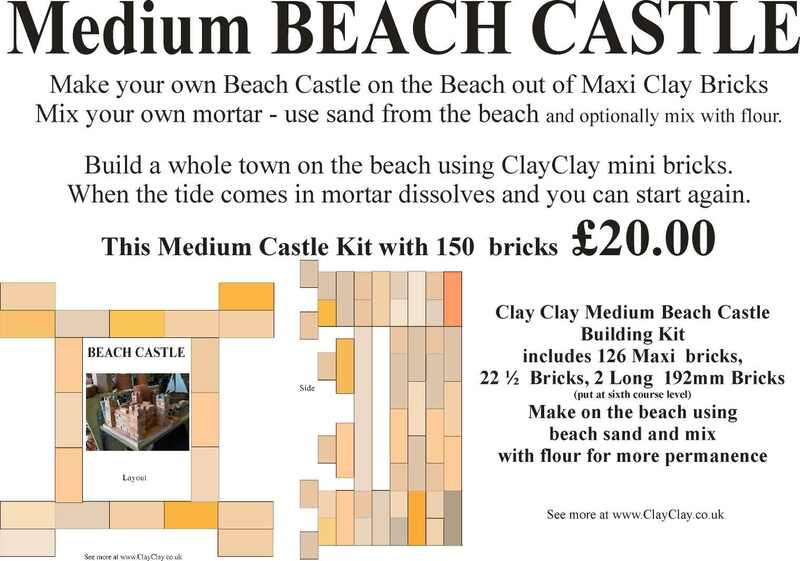 Make semi-permanent bulding or soak in 40C water which dissolves mortar and start again or (optional) ClayClay ‘powdered’ mortar. 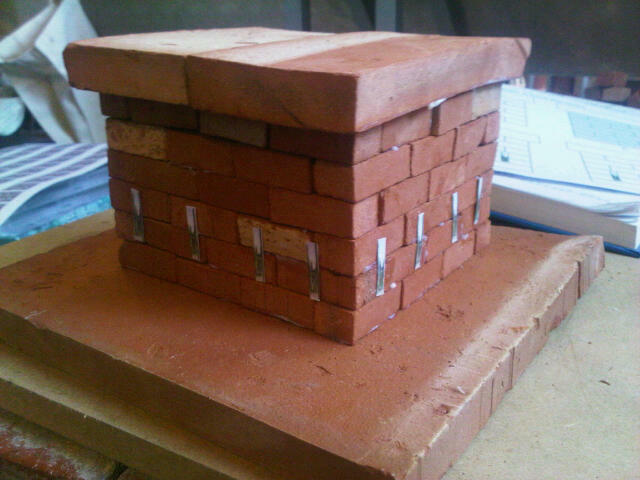 Roof suggestions and Terracotta bases as well as Glass windows, laminated windows, doors, car decals etc available. 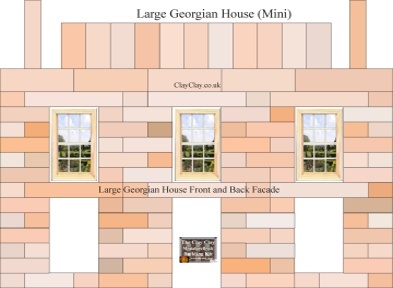 Small Georgian House Clay Clay Brick Building Kit. 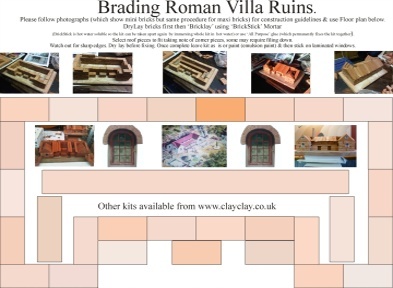 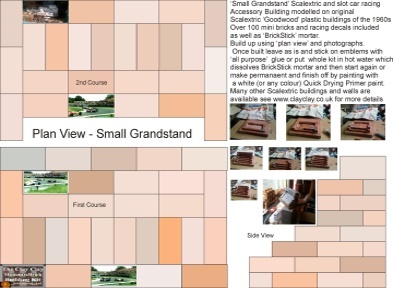 (54 Miniature Clay Bricks 32*16*10.5mm, plus 6 64mm long, 2 48mm long, 5 Roof pieces, Laminated Windows and Doors to cut out and stick on, ‘BrickStick’ (Mortar) or (optional) ClayClay ‘powdered’ mortar and Layout Plan). 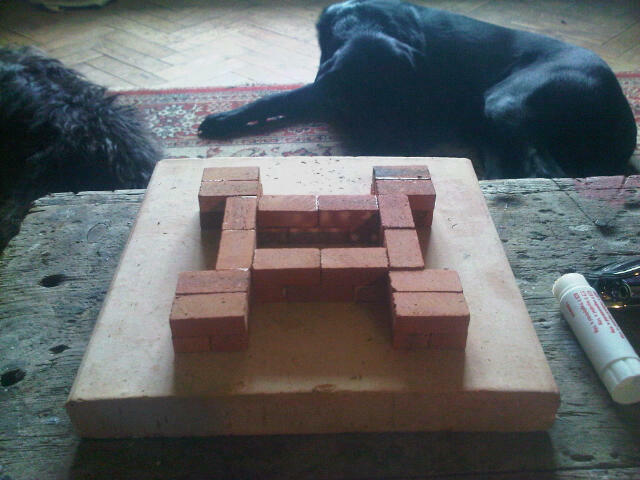 £11.00 (£15 using larger Maxi bricks). 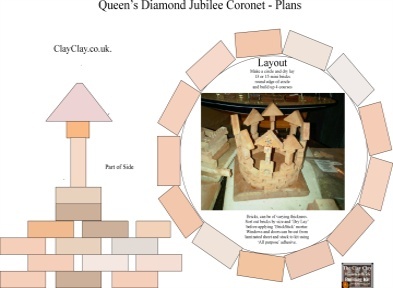 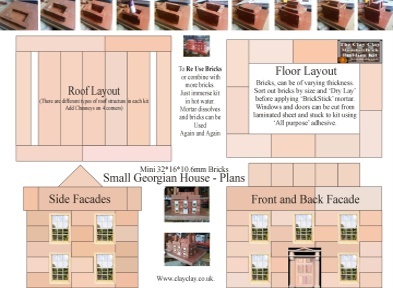 Building Step by Step the Small Georgian House Clay Clay Brick Building Kit (roof structure varies to images shown). 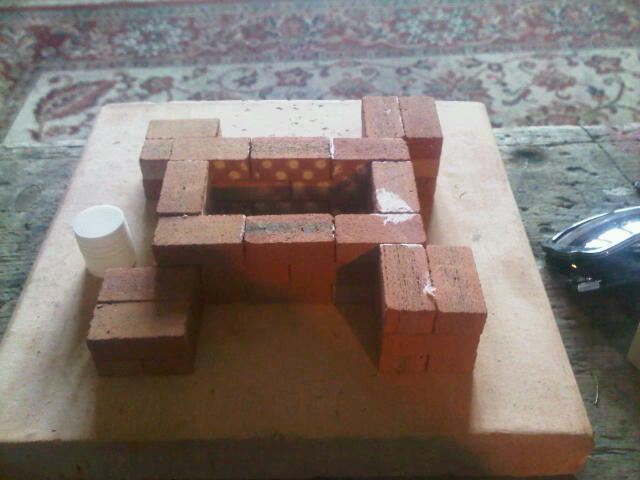 Build up 1 or 2 courses of brick at each corner and ensure they are vertical and square using a couple of set squares then dry fit the intermediate bricks to ensure a good fit and dimensional accuracy before fixing (semi) permanently in place. 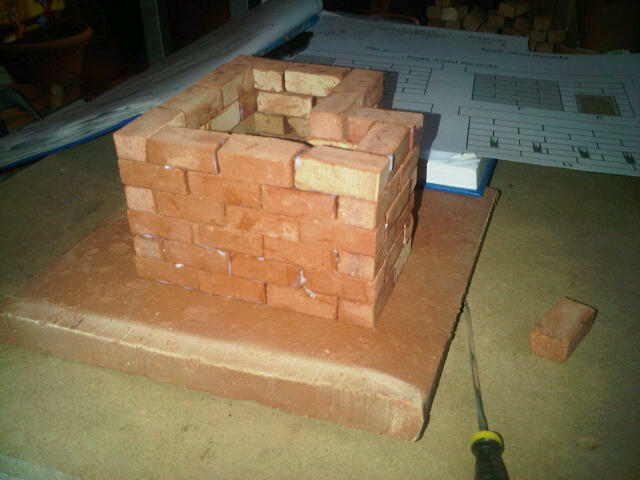 Shorten any bricks that are too long with a course file. 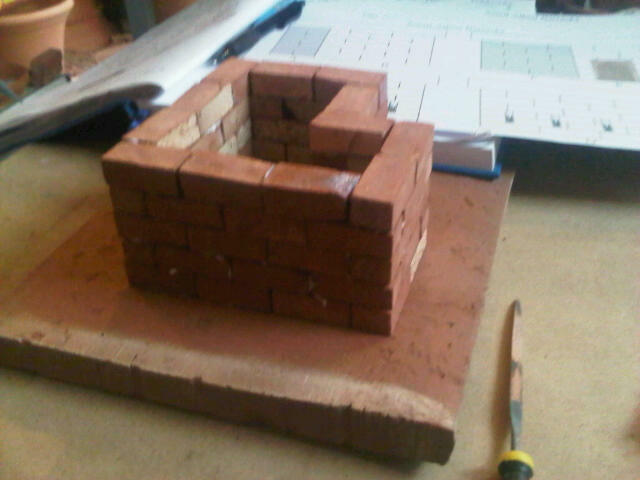 Any variations in the thickness of the bricks can be corrected with the thickness of the mortar. 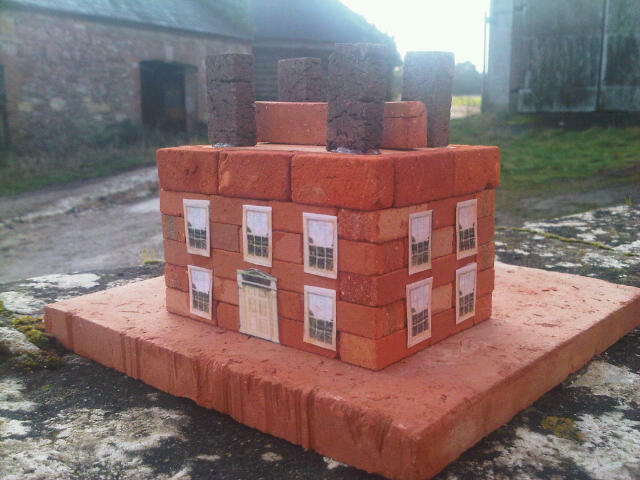 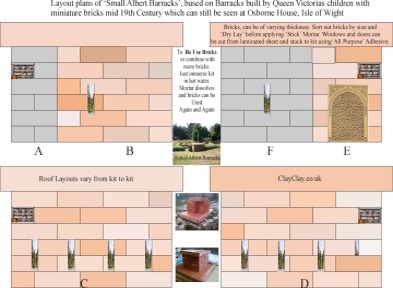 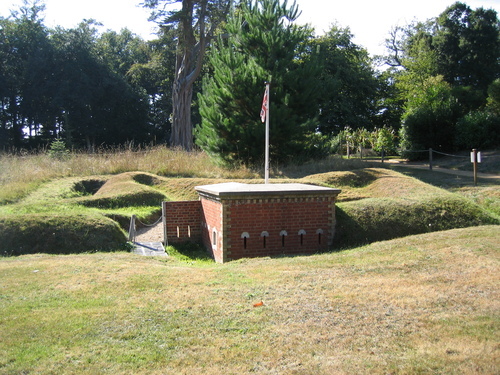 Small Albert Barracks Clay Clay Brick Building Kit. 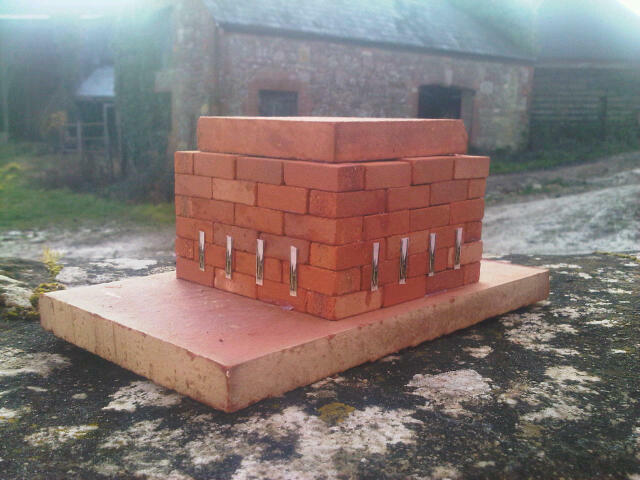 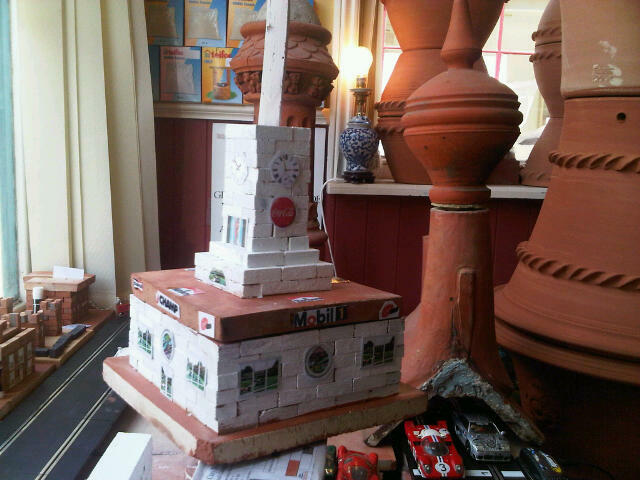 The 72 brick kit includes terracotta roof, laminated windows (to stick on) and ‘BrickStick’ ‘mortar’. 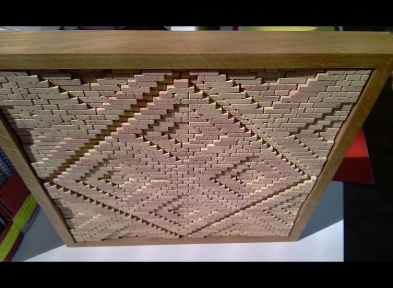 It can be constructed by young (over 8 years old due to sharp surfaces ) and old (under 80 years old due to sharp surfaces). 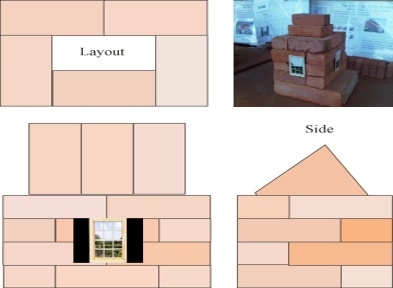 Bricks are reusable by dissolving ‘mortar‘ in hot water. 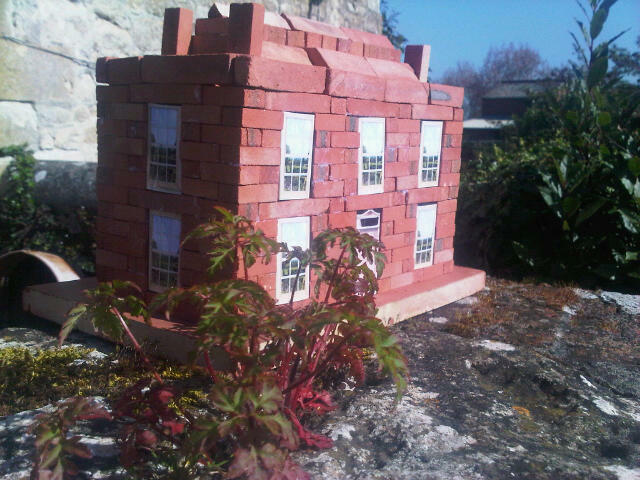 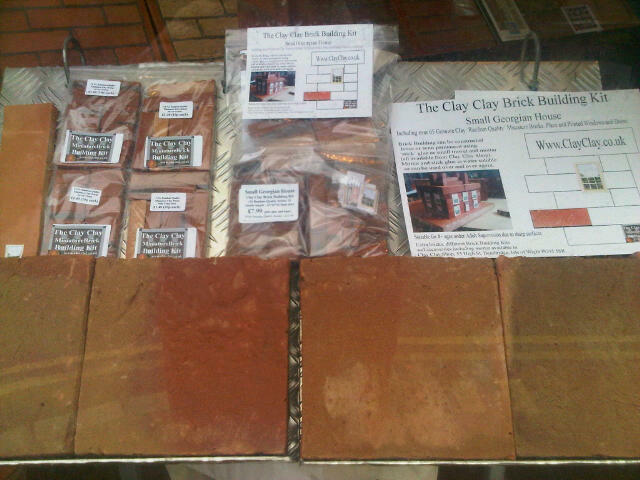 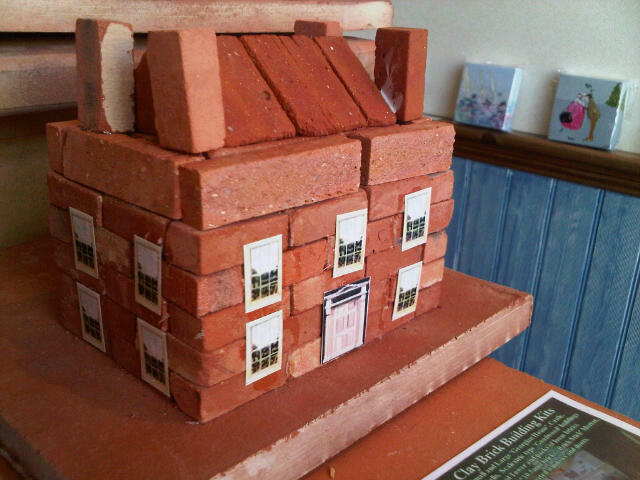 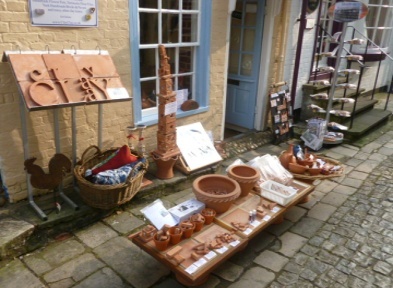 Clay bricks are made from York Handmade Brick ‘terracotta’ and some from Genuine old Reclaimed Isle of Wight - made bricks. 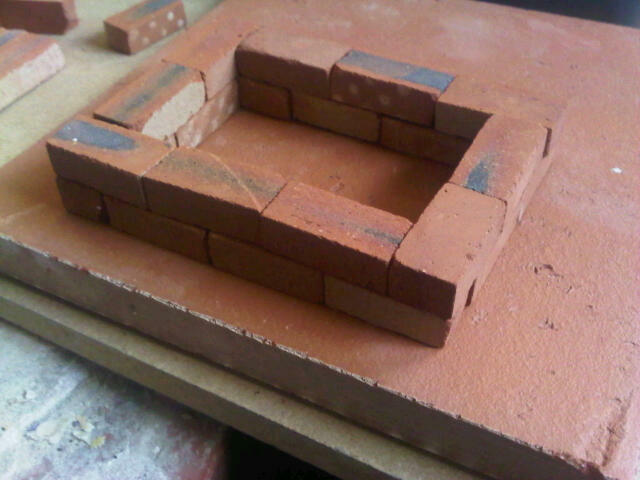 Brick size 32*16*10.5mm in ‘Random’ Quality. 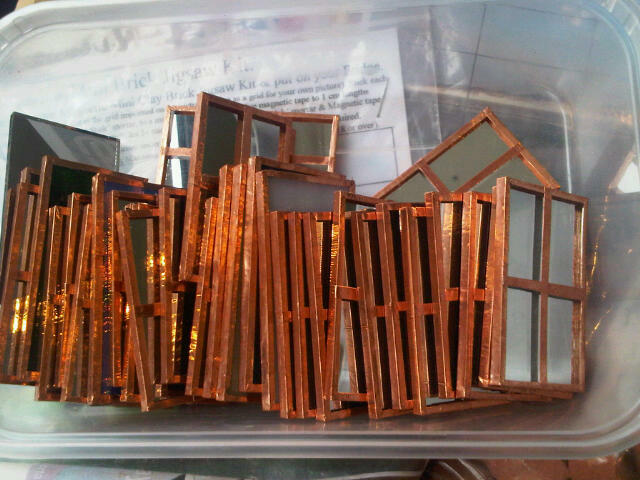 Dimensions 115mm Long * 115mm Width * 98mm High. 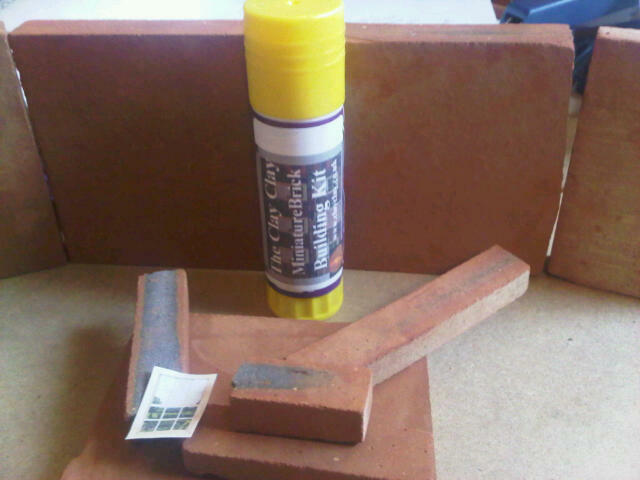 Either construct loose or ‘mortar in’ using supplied ‘BrickStick’ (mortar). 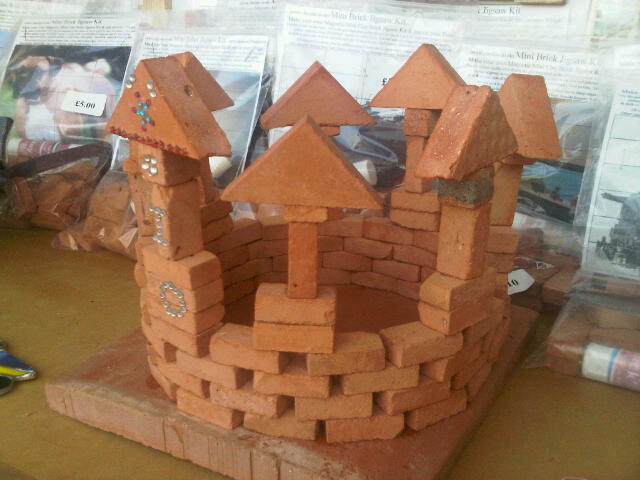 Terracotta bases (200*100mm) and extra bricks are available. 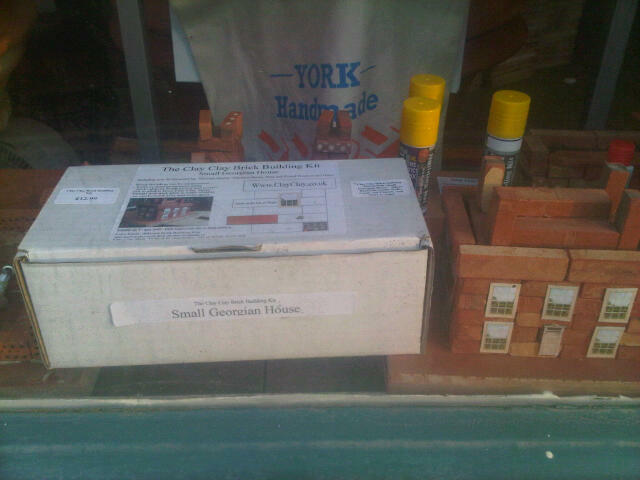 Kit £12.00. 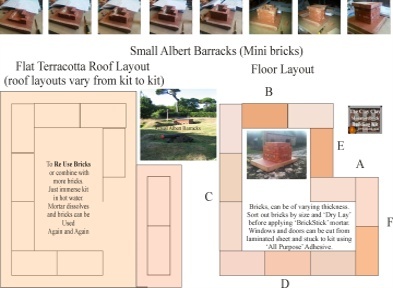 Building Step by Step the Small Albert Barracks. 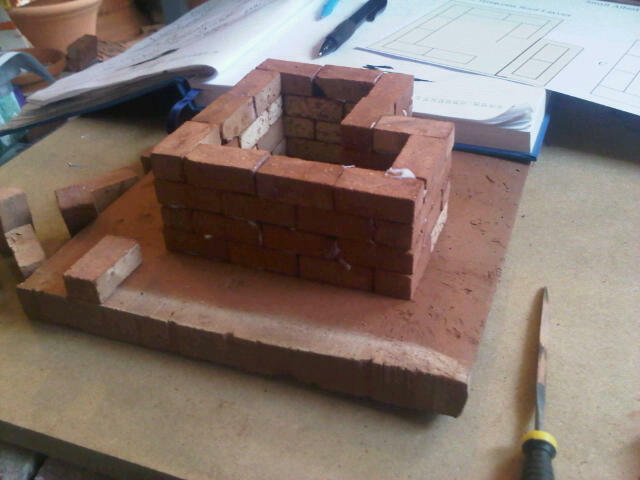 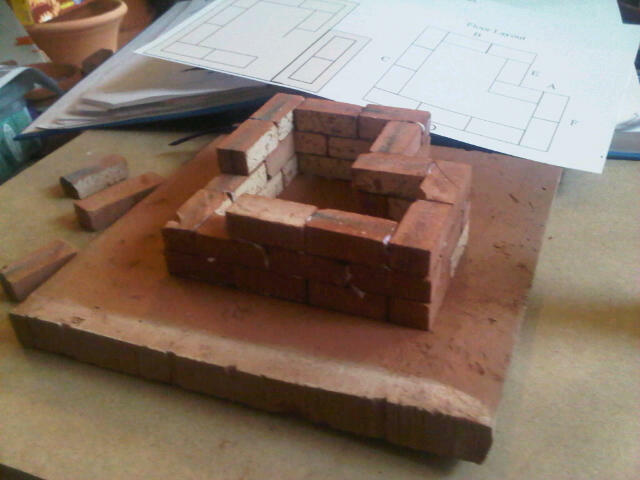 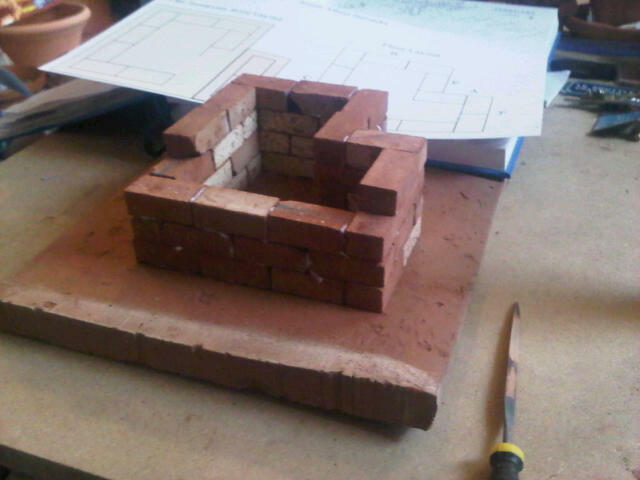 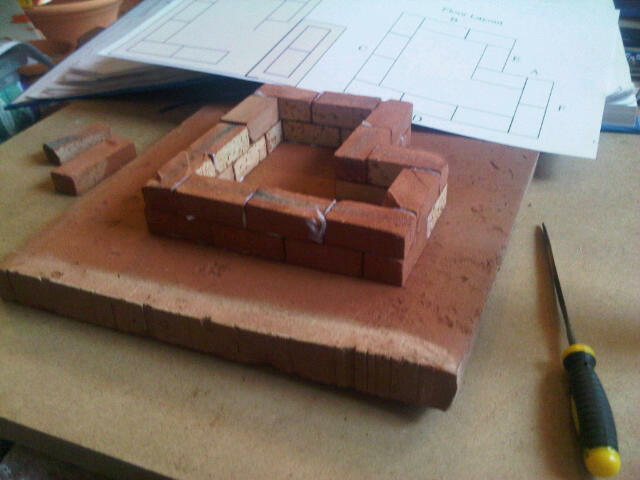 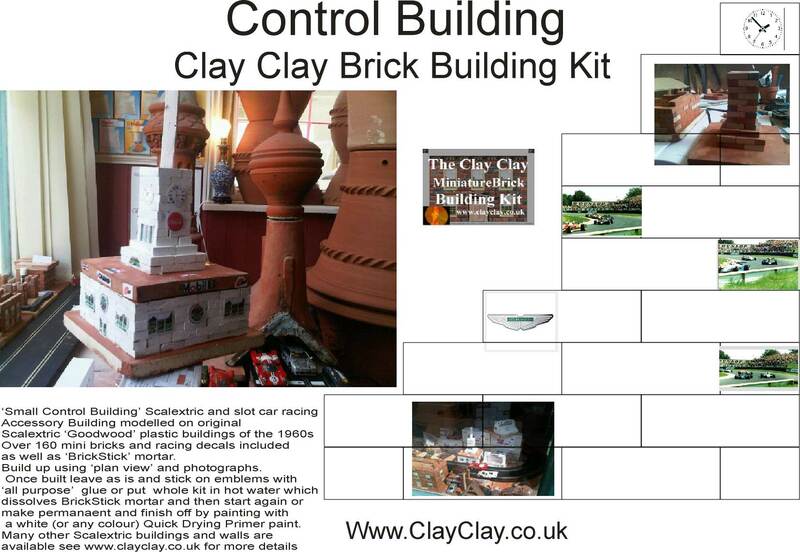 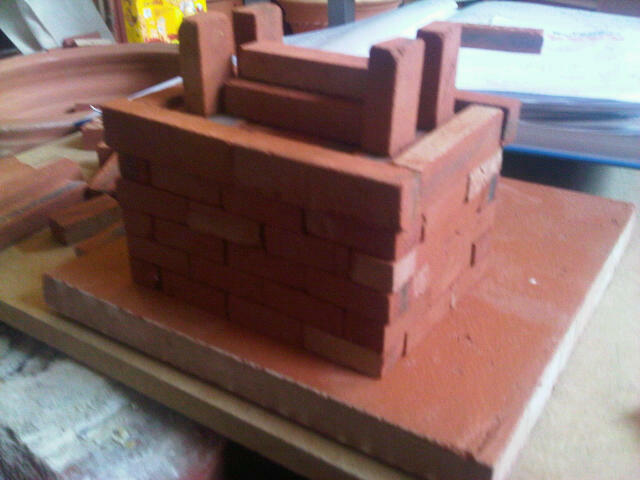 Clay Clay Brick Building Kit. 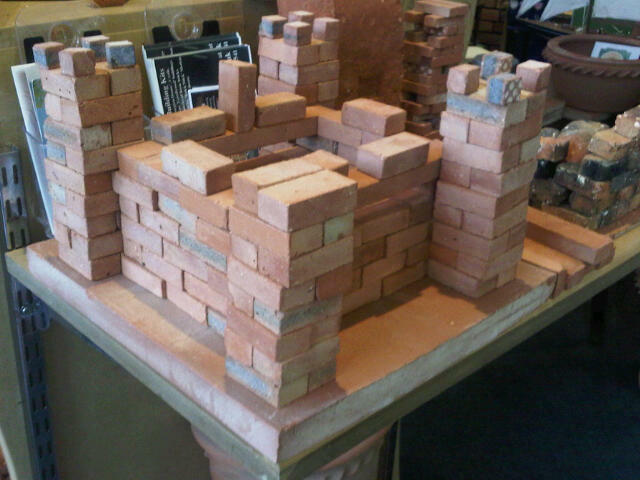 Build up 1 or 2 courses of brick at each corner and ensure they are vertical and square using a couple of set squares then dry fit the intermediate bricks to ensure a good fit and dimensional accuracy before fixing (semi) permanently in place. 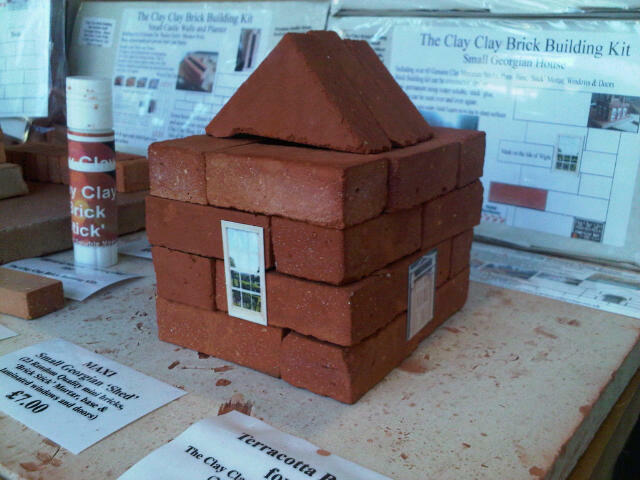 Shorten any bricks that are too long with a course file. 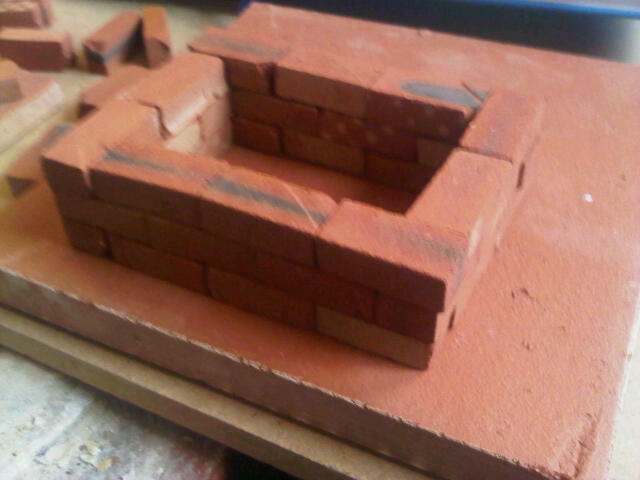 Any variations in the thickness of the bricks can be corrected with the thickness of the mortar. 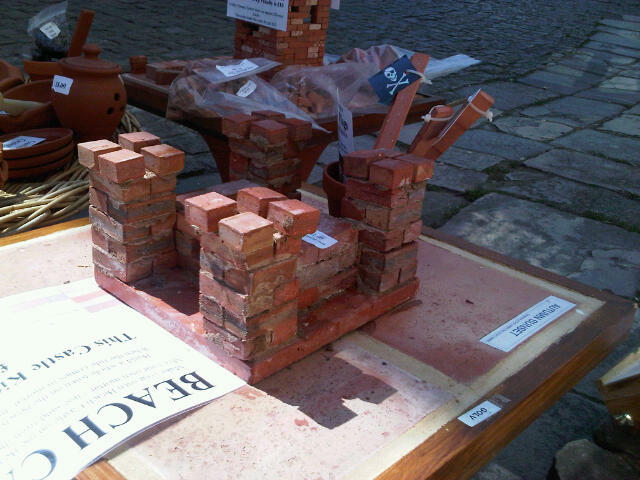 ‘Small Castle Walls Planter Kit (Base, Compost and Seeds included). 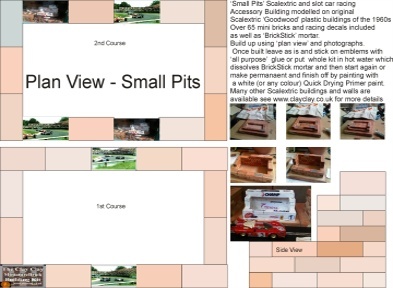 38 Miniature Clay bricks 32*16*10.5mm and 12 48mm length bricks (or similar), ‘BrickStick’ (Mortar) or (optional) ClayClay ‘powdered’ mortar, Terracotta Slab, Compost and Seeds (Thyme, Chives, Rosemary, Basil, Sage, Dill or Parsley), and and full layout plans and instructions). 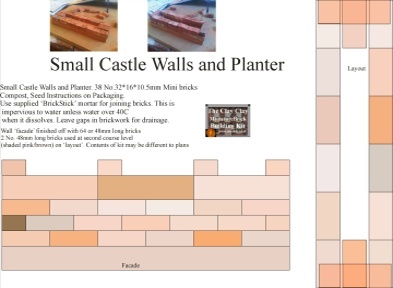 Small Castle Walls Planter Kit (compost, and seeds included). 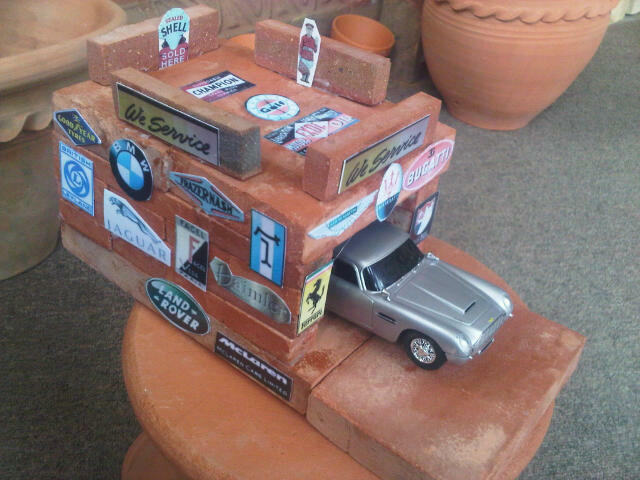 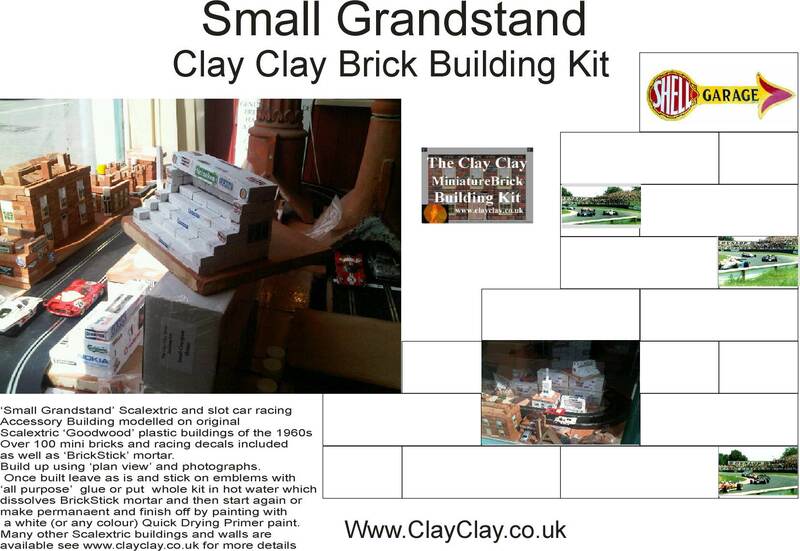 ClayClay Miniature Brick Building Kit. 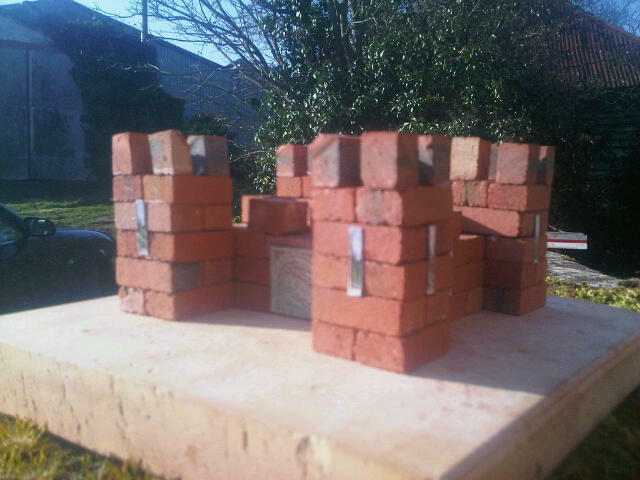 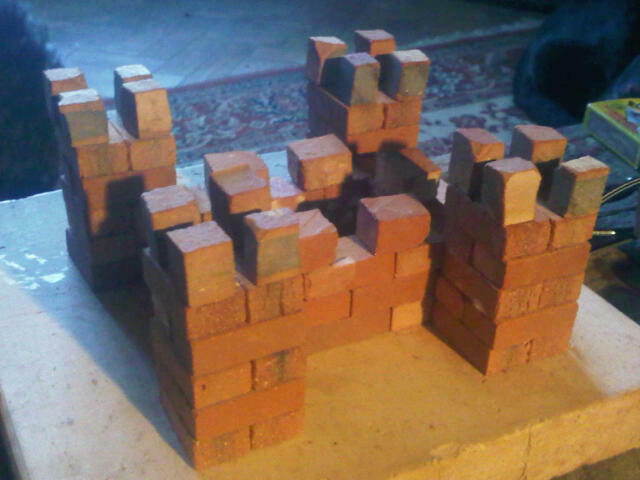 Building Step by Step the Small Castle Walls Build up 1 or 2 courses of brick at each corner and ensure they are vertical and square using a couple of set squares then dry fit the intermediate bricks to ensure a good fit and dimensional accuracy before fixing (semi) permanently in place. 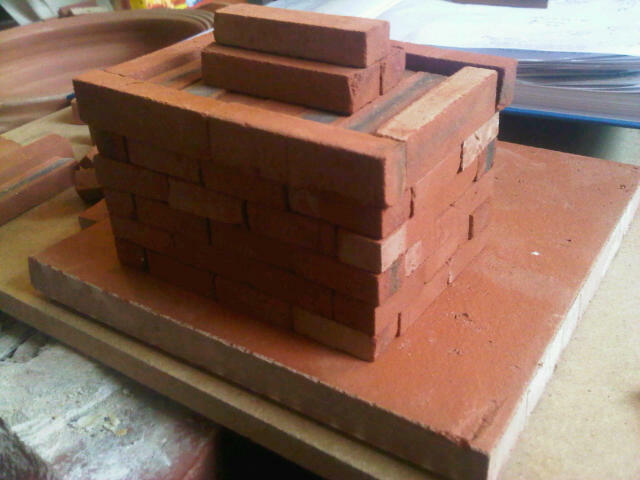 Shorten any bricks that are too long with a course file. 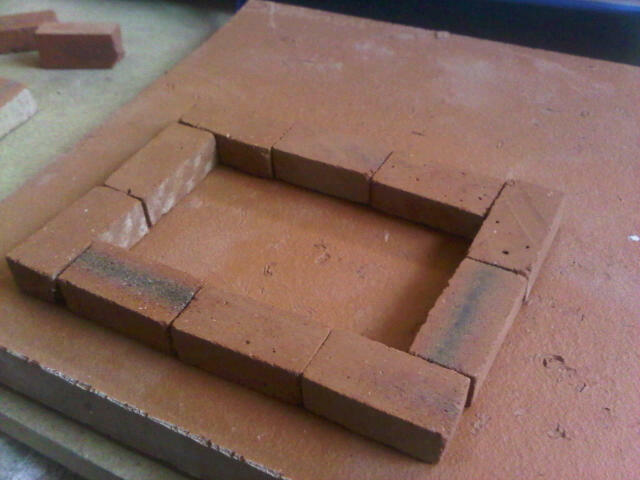 Any variations in the thickness of the bricks can be corrected with the thickness of the adhesive. 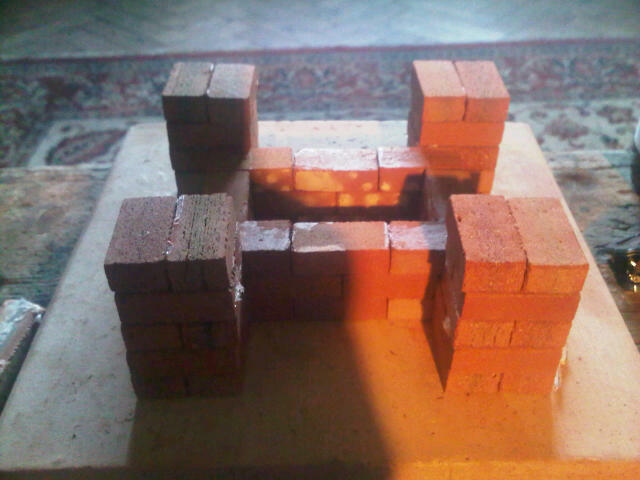 Building Step by Step the Small Castle. 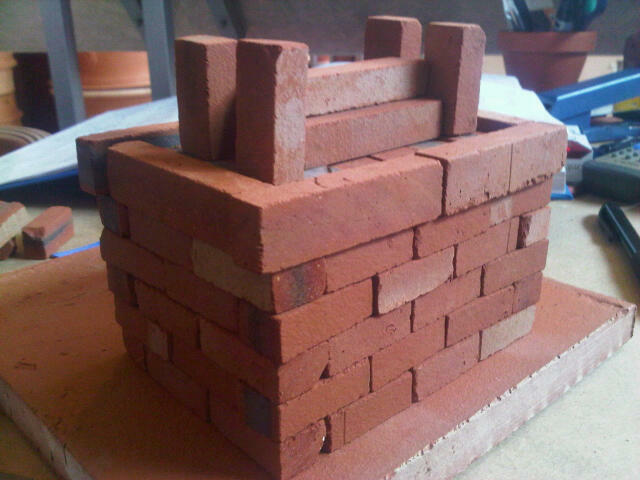 Build up 1 or 2 courses of brick at each corner and ensure they are vertical and square using a couple of set squares then dry fit the intermediate bricks to ensure a good fit and dimensional accuracy before fixing (semi) permanently in place. 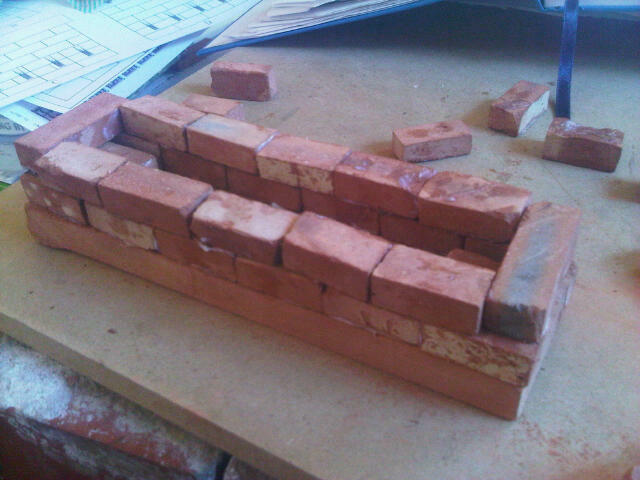 Shorten any bricks that are too long with a course file. 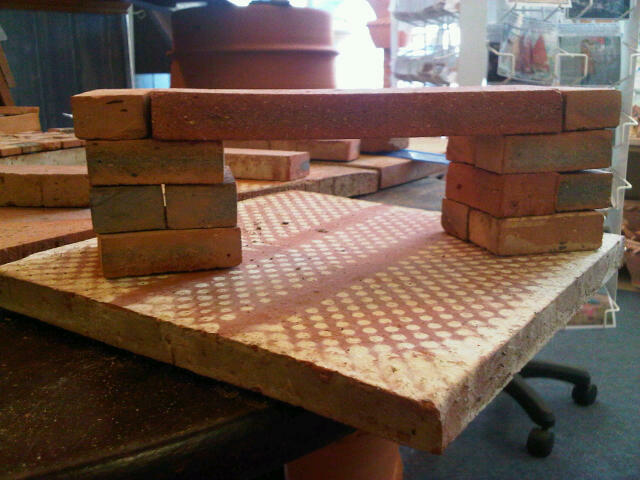 Any variations in the thickness of the bricks can be corrected with the thickness of the mortar. 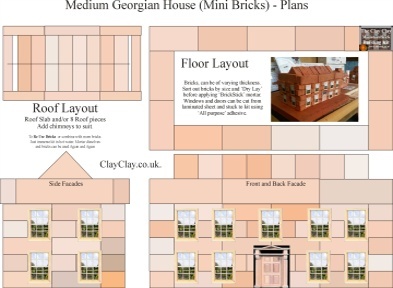 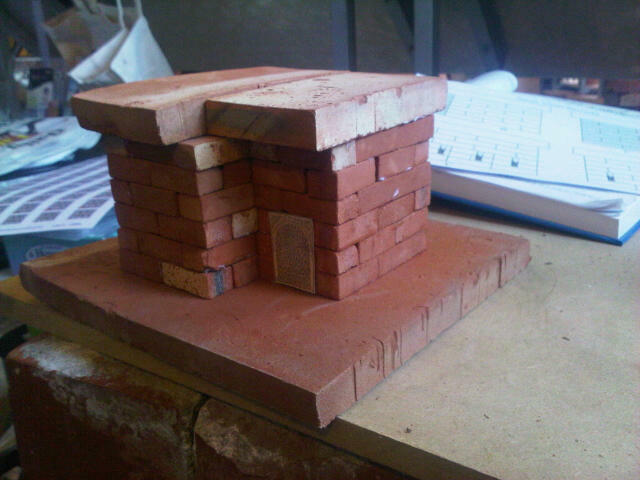 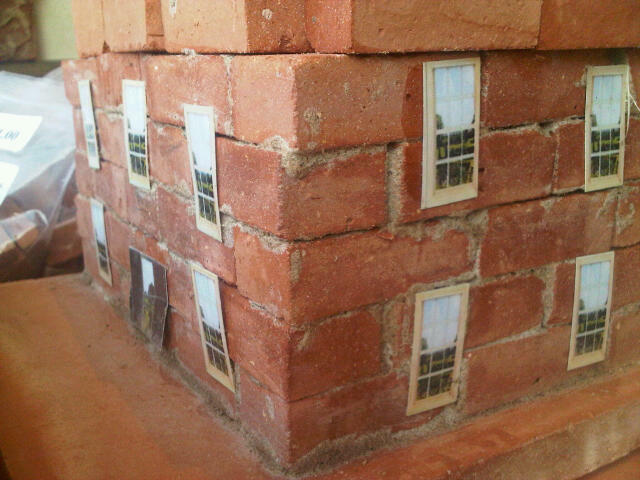 (64 Miniature Clay Bricks 32*16*10.5mm, plus 16 half size bricks, Laminated Windows and Doors to cut out and stick on, ‘BrickStick’ mortar, and Layout Plan). 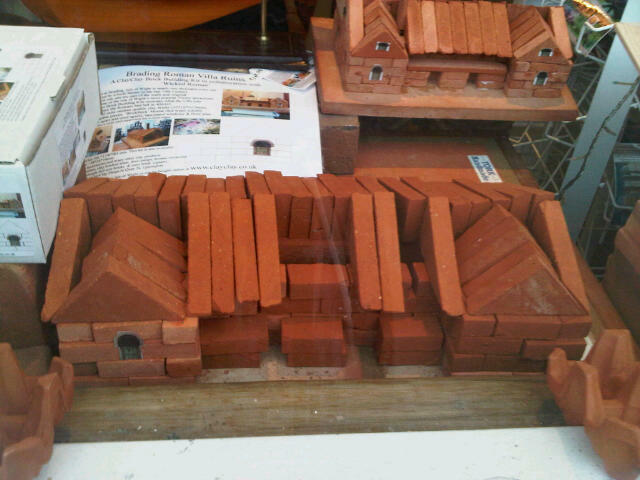 (350 Miniature Clay Bricks 32*16*10.5mm, 42 Other sizes and 11 roof pieces). 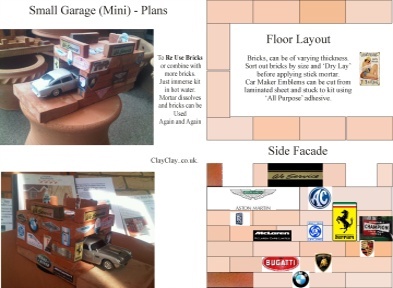 Small Garage Clay Clay Brick Building Kit44 Miniature Clay Bricks 32*16*10.5mm, plus 6 64mm long, 4 48mm long, 2 Roof Slabs, Laminated Car Emblems and garage signs cut out and stick on, ‘BrickStick’ (Mortar), 2 Terracotta Bases and Layout Plan). 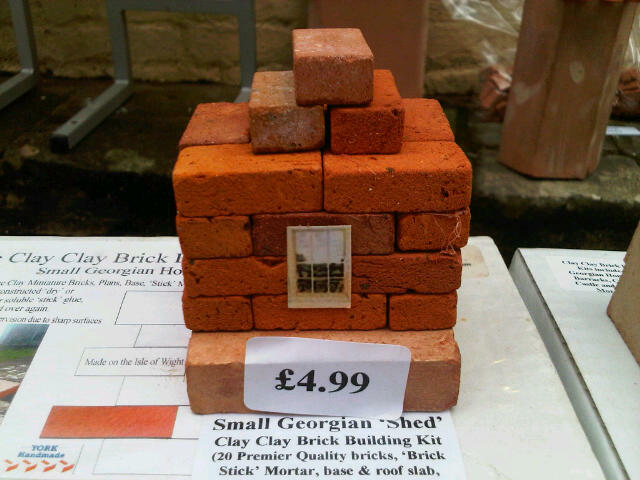 £11.00 - or £3.00 Conversion kit (2 slabs, 2 48mm bricks, car emblems) from Small Georgian House. 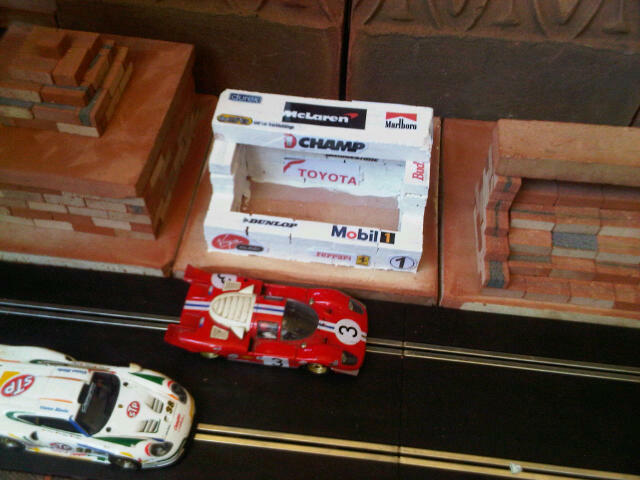 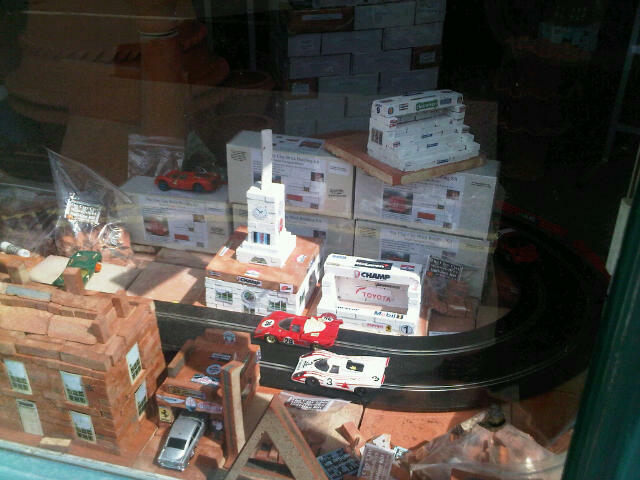 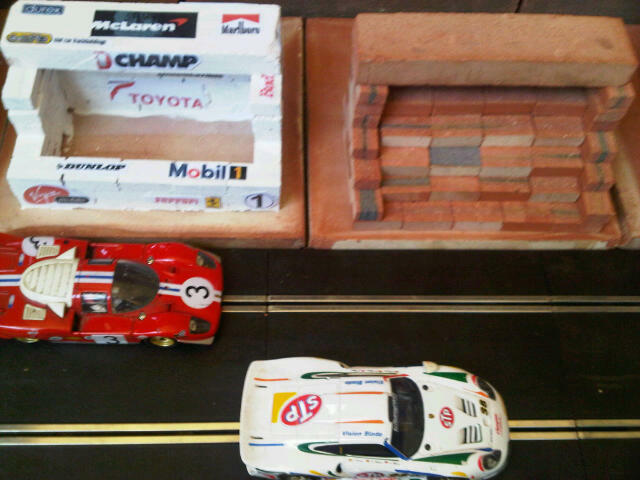 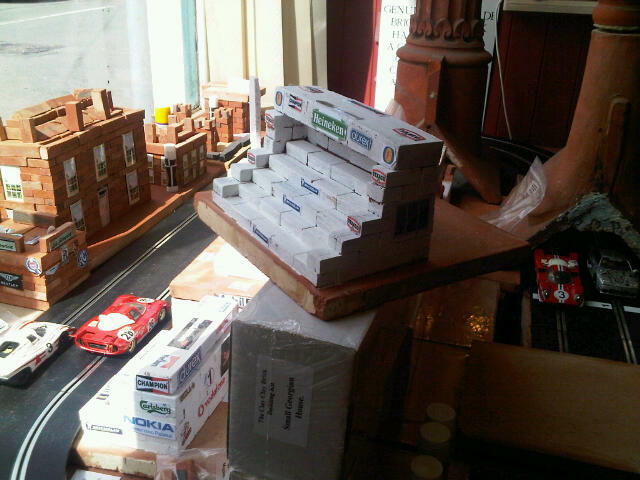 Scalextric Buildings - Pits, Control Building, Restaurant, Grandstand. 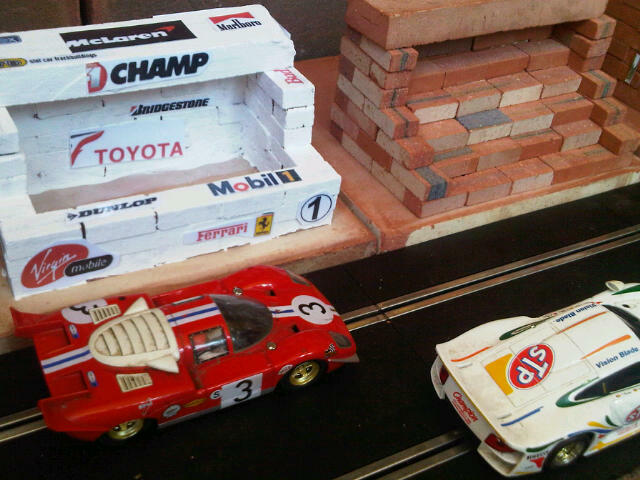 Similar to original range of plastic Scalextric Goodwood race buildings but in clay - built from mini bricks, painted (or not) and decals added. 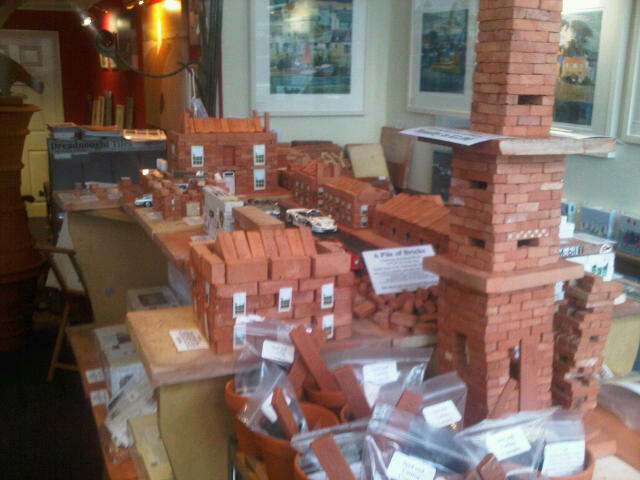 All mini and maxi bricks, roof pieces, half, double length, 1 1/2 length and bridge pieces, building plans, powdered mortar, ‘BrickStick’. 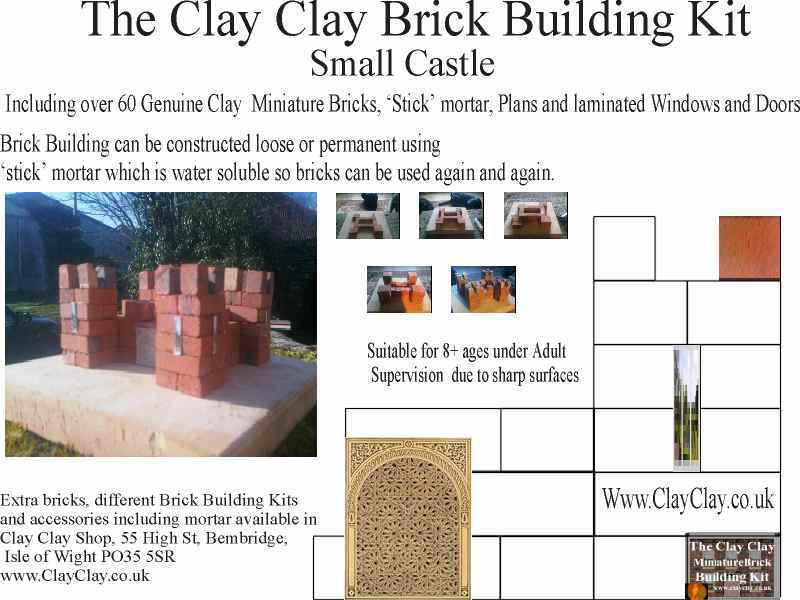 (Over 200 Maxi Clay Bricks 48*24*16mm half Handmade of Isle of Wight clay, Half machine made and cut from Yorkshire clay, 24 Other sizes and roof pieces, slabs and laminated windows and doors (Metal and mirrored windows and doors optional) included. 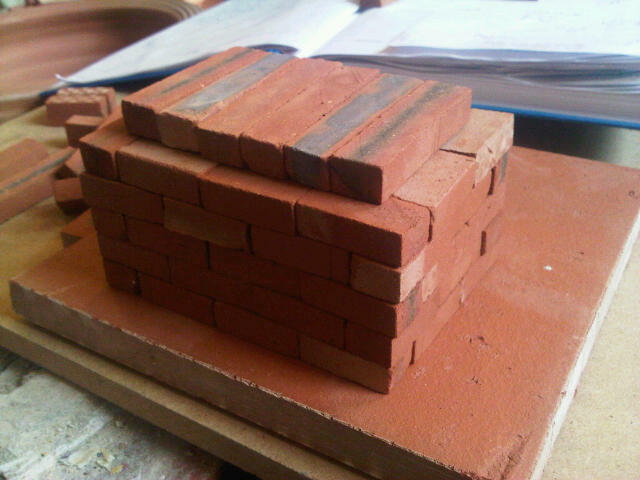 (58 Maxi Clay Bricks 48*24*16mm 2 96*24mm bricks, 22 24*24mm bricks. 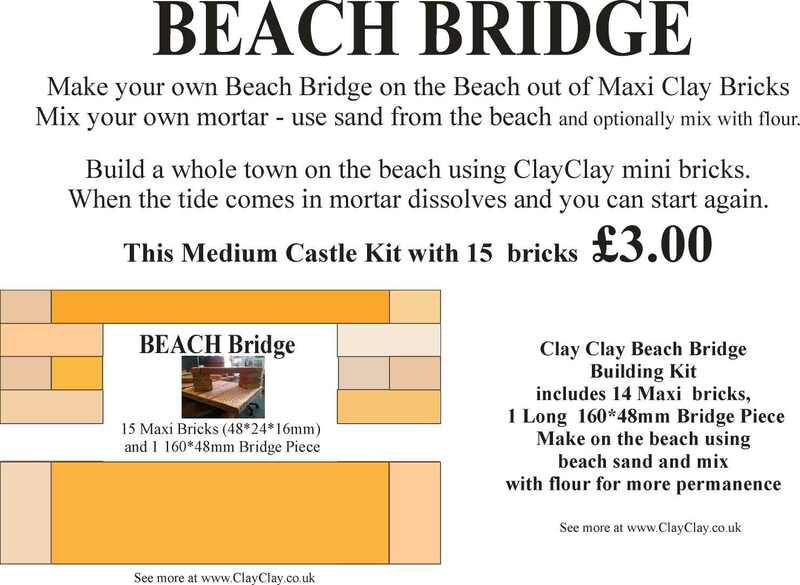 Make up your own mortar from beach sand mixed with flour. 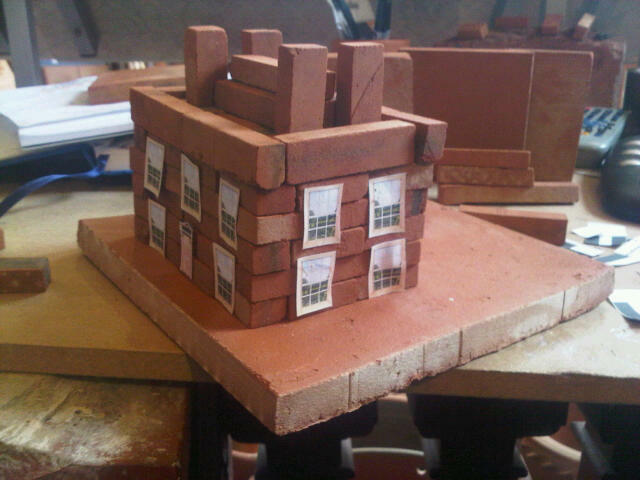 When tide comes in mortar dissolves and you start again! 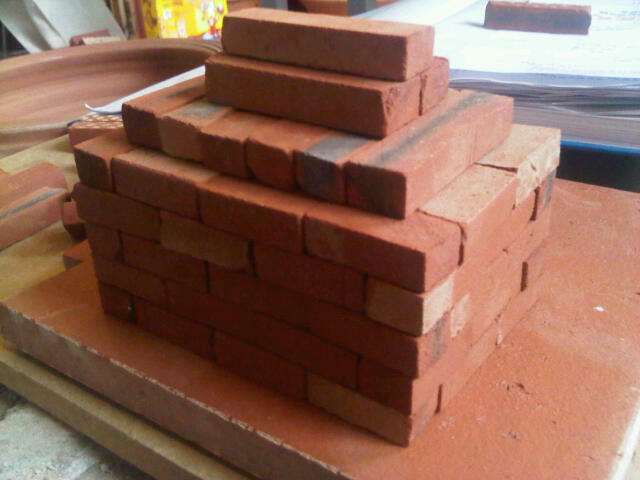 (126 Maxi Clay Bricks 48*24*16mm 2 192*24mm bricks, 22 24*24mm bricks. 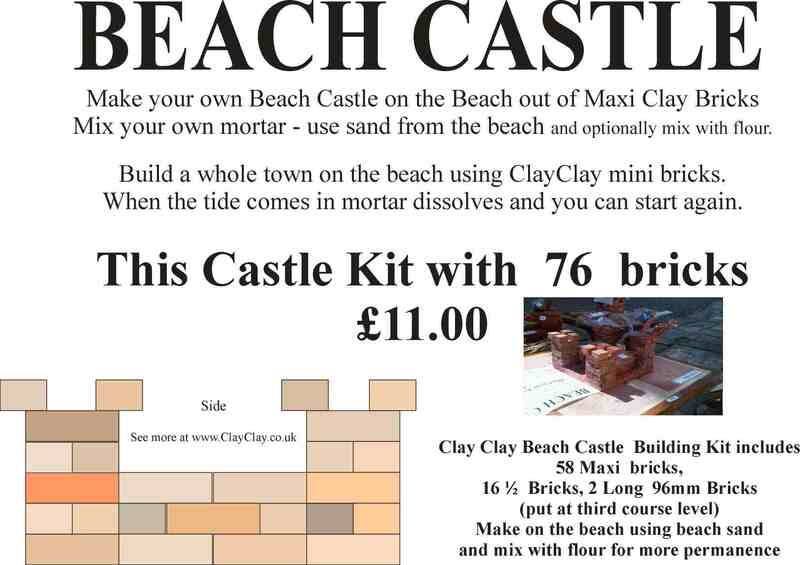 Make up your own mortar from beach sand mixed with flour. 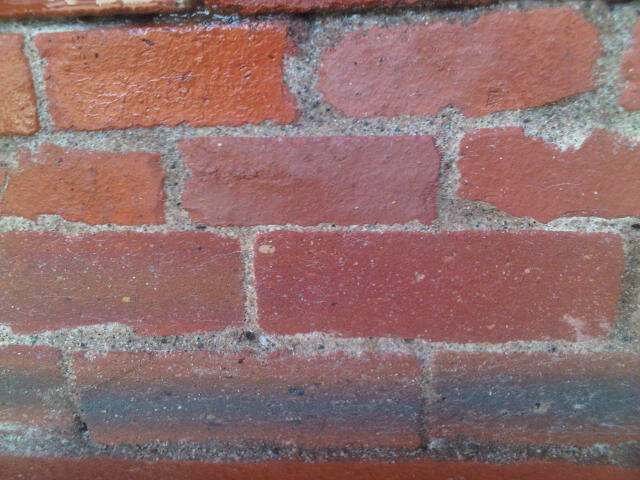 When tide comes in mortar dissolves and you start again! 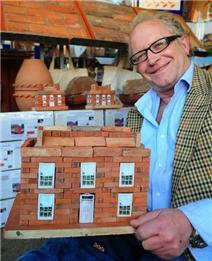 TIM Bristow is a man with a passion for bricks. 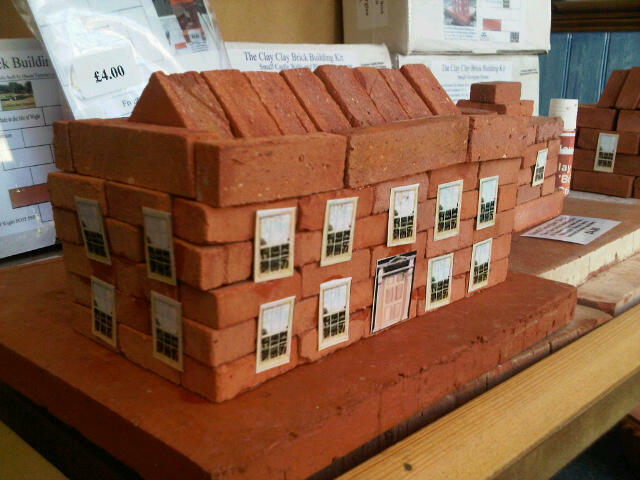 One of the founders of the York Handmade Brick Company and owner of Bembridge shop Clay Clay, which sells brick and terracotta items ranging from flower pots to kitchenware, Tim has now launched his own range of miniature clay brick building kits.Believed to be the only such kits manufactured in the UK, designs include a small Georgian house, a castle and a replica of the Albert Barracks - a miniature fort built at Osborne House by Queen Victoria’s children. 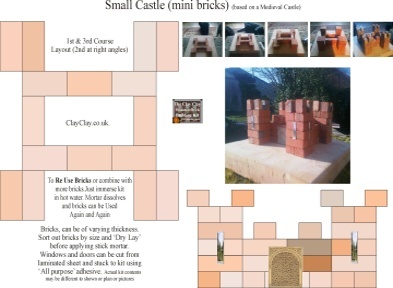 "Up to the early 1960s one of the most popular toys were building assembly kits, using little bricks, mortar and a bit of patience but the introduction of plastic bricks saw their popularity diminish," said Tim, 51, of Nettlestone. 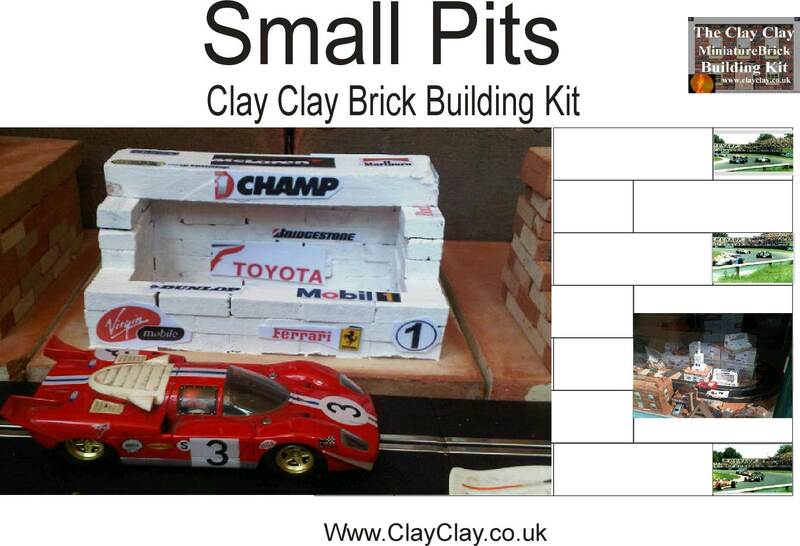 "The Clay Clay kits are all made here in the shop and the reaction so far has been very positive," he added. 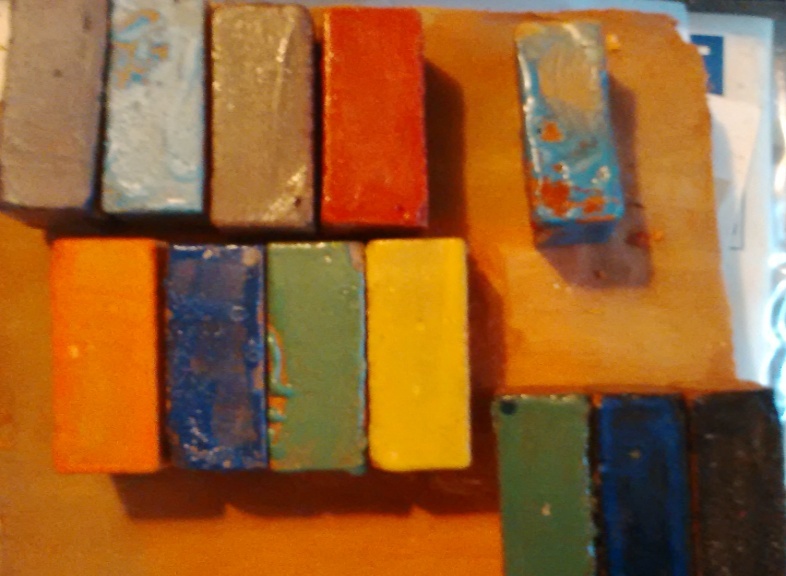 "I think parents are sick of their children playing on the computer instead of doing something creative and thats part of their appeal." 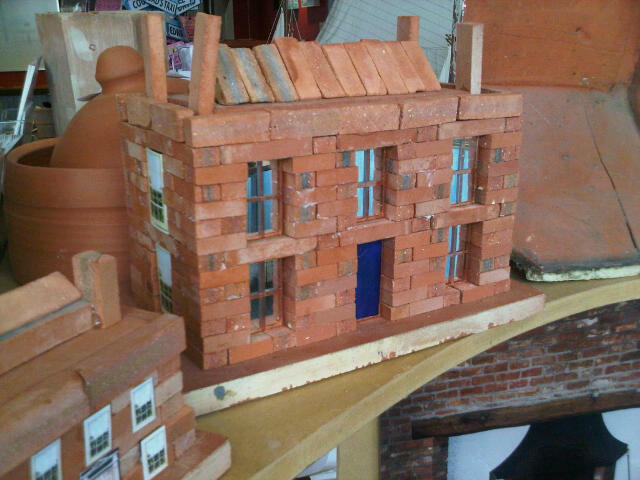 Every kit has been lovingly put together by Tim, and includes miniature bricks sourced from reclaimed IW bricks and terracotta made by the York Handmade Brick Company, mortar, plans and laminated windows and doors. 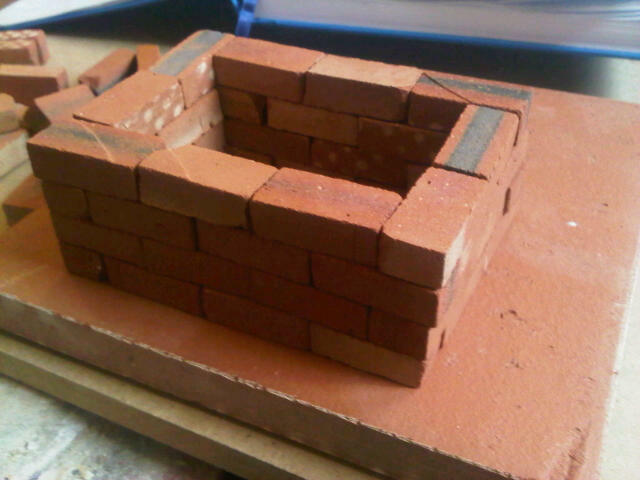 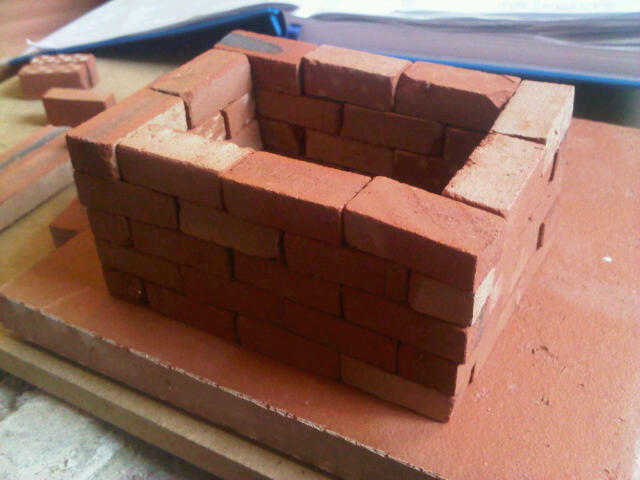 They range from 50 bricks, for the more simple designs, to 350 bricks for those looking for more of a challenge. 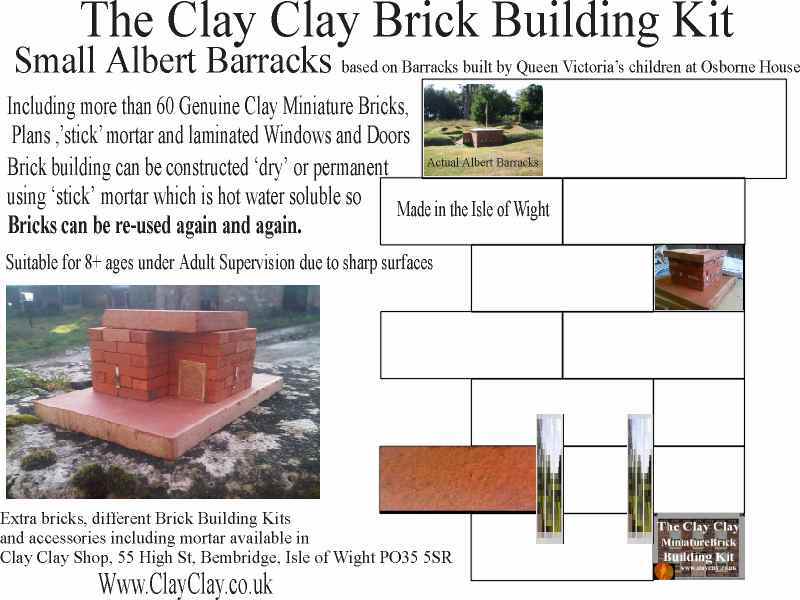 The Island is well known for bricks and pottery making and there were more than 80 brickworks on the IW until the 1970s. 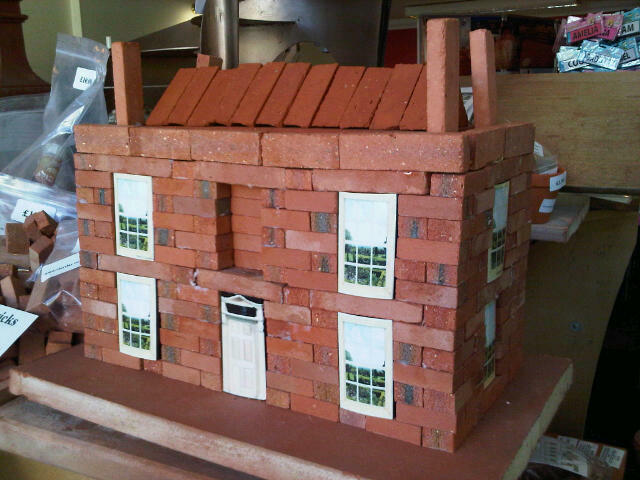 "I was inspired to make the kits because I spotted a gap in the market but also because I have an absolute passion for bricks," said Tim. 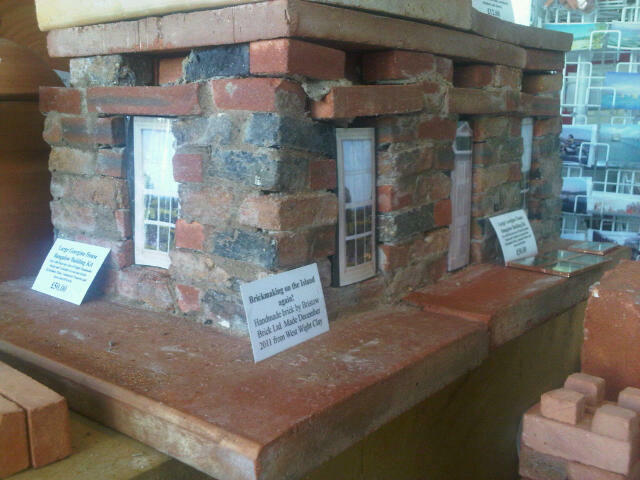 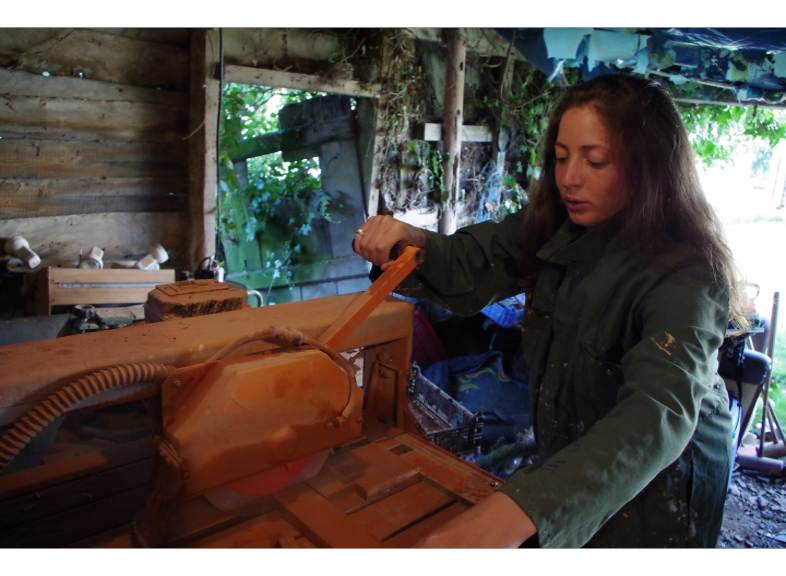 "The history of brick making on the Island is very rich and I can’t believe no-one does it any more." 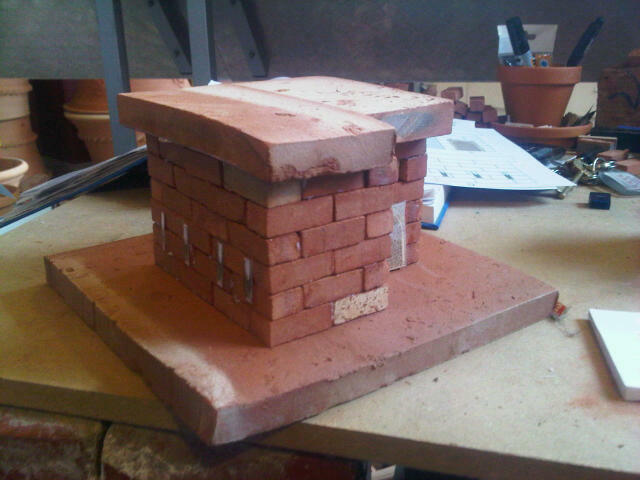 Tim’s kits will be on display at this years Grand Designs Show, in London, from April 30 to May 8.